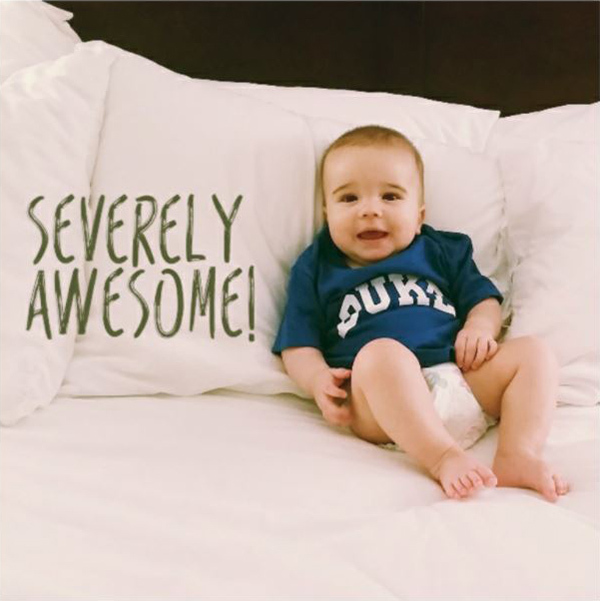 A year and some change have passed since we traveled to North Carolina to introduce Gabriel to the fine folks at Duke University, where they are doing such amazing things for people with Pompe. As I write this, I reflect on a letter I sent family members when we returned home. I also am fairly stunned by the thought that – all these months later – It is a challenge to stay a step ahead of Gabriel when it comes to baby proofing cabinets, keeping small, sharp and shiny objects out of reach and… I just walked away from the computer. Back to the visit and that letter. I got the important stuff out of the way first. The stage mom part. I reveled at what an amazing traveler Gabriel was. He was a dream on the plane, earning plastic wings and a picture with the pilot and many compliments along the way. “Look at those eyebrows!” “What a sweet baby!” He even said “Da Da!” for the first time in front of a captive crowd of travelers who appropriately oohed and ahhed. In three full days of clinics, we checked off all the specialist boxes (heart, lungs, ears, eyes and so on) and were encouraged by Gabriel’s high marks. We had an extensive meeting with Dr. Priya Kishnani, who is the lead in Pompe research and as kind and loving as she is brilliant. Things still looked good. Our last visit was with the physical therapist. By that time, my guard was down and my optimism up. The PT was as wonderful as every other person we met. That kindness showed when she told us that, at six months, Gabriel was in the 1st percentile on the Alberta Infant Motor Scale. I asked her what that meant. Her answer: Gabriel was “Severely Delayed” physically. Similar to the moment I heard his final diagnosis of Late Onset Pompe Disease, I don’t recall hearing much after that. I recall her saying his core and glute muscles weren’t where they’d like them to be for a 6 month old. I remember joking that I could relate. Mine are nowhere where I’d like them to be. Then, she told us these are areas in which they see the first signs of diminished muscle capacity in “Late Onset” Pompe patients. There was no joking then. I remember that that hit pretty hard. Cody and I found a lovely Italian restaurant near our hotel. The owner was so kind and began calling our baby, “GOBB-REE-A-LAY!” It was love at first site. I’m pretty sure we stuffed our emotions there with a ton of carbs and a dessert of “Stuff it Up!” We didn’t have time for pity or worry. When we came back home, we were blessed to connect with Missouri First Steps and even more so to be matched with Gabriel’s Occupational Therapist, Miss Nicole. She is an amazing woman with the heart of a mother, teacher and friend and has been all of those to our family. Nicole comes weekly. Now and again, Caitlyn – a Physical Therapist – comes to the house. They are in communication with the PT at Duke, who is also God-sent. Gabriel began his sessions with fear and exhaustion. Now, he gets so excited to see Nicole and is so proud to do hard workouts with her. To anyone who sees Gabriel, he looks “normal” (I’m still trying to figure out just what that is!) But, he works hard. He has worn crazy pants to keep his legs together at night. Picture shimmery Richard Simmons-esque bicycle shorts with the legs sewn together. He wears an abdominal binder. Picture Spanx. All of these things are to encourage his muscles and mind to work together in the best ways possible and, if possible, stave off his need for medication as long as we can. No kidding, when I sat down to write this, I heard a “curplump” and ran to the toilet (feet from where I sit) to find a smiling Gabriel and our TV remote in the bowl. As frustrating as these moments are (and, full disclosure, I raised my voice a little lot) they are also the moments in which I realize: We have a toddler on our hands. We have a mess. We have so much for which to be thankful and grateful to God. I sent this picture to friends and family after learning Gabriel was “severely delayed.” One year later, it is as true as it was when I took it.